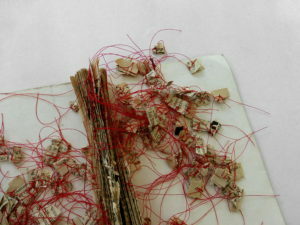 For two days we explore the possibilities of books as a material for creating unique artefacts. We will dissect, dissolve and pierce to see the inner structure of the story. We will form, sew and glue new connections, add found objects and mend holes. Texts outgrow themselves and become sculptural. The story is told in a new and tactile way, with added layers, unique twists – often without reference to words. As we create book objects, we give a lot of space to your creativity and the fun of experimenting. • 7 to 10 books: old or new, paper back or hard cover, thick or thin, with or without images … everything is possible. A mix is recommended to have a good choice. • additional material of your choice: beads, buttons, wool, found objects, wire,…. • if you would like to work with paint, feel free to bring some favourite colours, inks and acrylics etc.